So, What Is Neuroplasticity? Blowing away decades of scientific dogma, the recently discovered "neuroplastic" nature of the brain means that our potential is not set at birth — we can actually strengthen and improve our brain in ways once believed impossible. Rebecca Gladding M.D., author of "You Are Not Your Brain" recently wrote: "The brain, and how we are able to mold it, is fascinating and nothing short of amazing." Scientists Agree: Meditation Is The #1 Brain Changer. So, what's the best way to build a better brain? 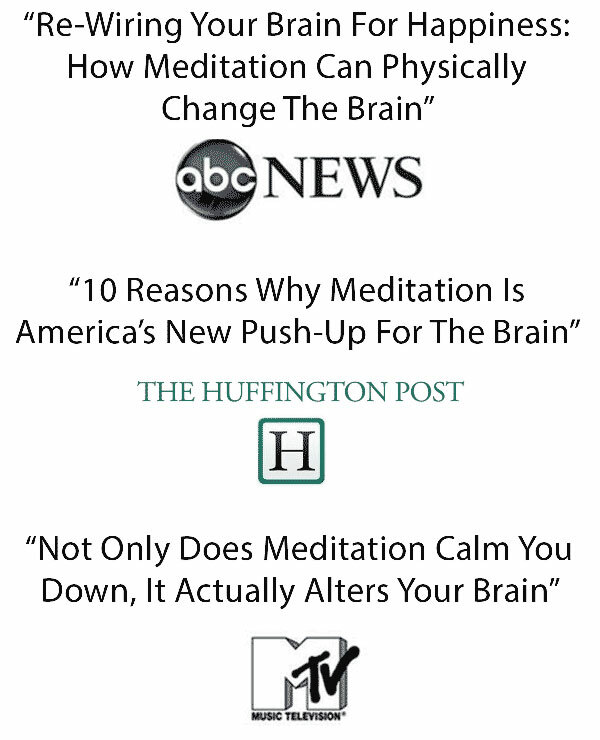 Backed by 1000's of studies, meditation is the neuroscientific community's most proven way to upgrade the human brain. Here we dive into 9 key brain regions enhanced through meditation, with a focus on the massive life-transforming implications. To be a happy and healthy human, most of us know that we need to sleep well, eat right, and exercise. However, very few of us realize just how important "human connectedness" is to our overall mental, emotional, and physical well-being. We are social creatures after all. According to a highly referenced 300,000+ person study published in the esteemed 'PLOS Medicine' journal, people with the most social relationships (both quantity & quality) are not only much happier, but live 50%+ longer (!) than the rest of us lonely folks. Another study by UCLA Professor of Medicine Dr. Steve Cole showed that "feeling connected" to others strengthens immunity, while other studies have cited lower levels of anxiety and depression, higher self esteem and empathy, the list goes on. Because of the human mind's tendency to obsess over the past and worry about the future (instead of simply being present), too much time alone can have real mental and physical health consequences. Thinking back, when were your happiest times? For most folks, those precious, magical moments with beloved friends and family quickly come to mind. Whether we are playing games, eating, drinking, talking, or laughing with our loved ones, the natural human connection we feel anchors our awareness firmly into the present (instead of worrying and obsessing when alone). While the very best cure for loneliness is a strong "in-person" social network (i.e. not Facebook) and a loving family, this isn't possible for everybody. Unless we go back to tribal living like our ancient ancestors, a more realistic solution is ideal. Luckily, neuroscientists are on it. When we feel isolated and separated from the "whole," one particular brain region (the "parietal lobe") becomes overheated. To prevent your car engine from burning up, you need a good radiator. To ensure loneliness doesn't roast your brain, you need to keep your parietal lobe calm, cool, and collected. Thankfully, meditation is up to the task. A University of Pennsylvania scientist, Dr. Andrew Newberg, took brain images of Tibetan Monks during meditation. As expected, their "highly intelligent" frontal lobes lit up the screen, just like countless other studies had shown. However, what surprised him most was that the meditators' "third-dimensional" based parietal lobes cooled off immensely, which is the same area that loneliness and social isolation brings to a boil. Dr. Newburg, now a bestselling author, writes "When people lose their sense of self [in meditation], feeling a sense of oneness, [this] results in a blurring of the boundary between self and others...[with] no sense of space or passage of time." By making us feel connected to everyone and everything, meditation cancels out the detrimental mental, emotional, and physical effects of loneliness. You know, that problem plaguing more than half of modern society. While friends come and go, meditation will always be there for you. According to Dr. Roger Sperry's Nobel Prize winning "split-brain" studies, like a dominant hand, most of us heavily favor one side of our brain. "Each hemisphere is a conscious system in its own right, perceiving, thinking, remembering, reasoning, willing, and emoting, all at a characteristically human level," said the great neuroscientist. Dr. Sperry's model suggests that left-brained people are generally more logical, practical, and analytical, often better at math and science. Right-brained people are generally more imaginative, intuitive, and sensual, often excelling at philosophy and the arts. While a great deal of Dr Sperry's "left brain / right brain" research still holds true today, certain parts of his model have been updated over the last 40 years. For example, neuroscientists have recently learned that highly creative people are actually "whole brain" thinkers rather than just "right brain" thinkers. However, his "imbalanced" brain findings have stood the test of time. That's the focus here. Like a tennis player with one big, strong, and coordinated arm and one scrawny, weak, and uncoordinated arm — because our dominant brain hemisphere gets so much action, most of us have "over-strengthened" one side of our noggin while "neglecting" the other. "Then, what about people like Elon Musk, Richard Branson, and Steve jobs, where do they fit into this so called "left brain, right brain" paradigm?" Brain imaging studies have shown that highly successful, massively creative people use both brain halves in a much more balanced and integrated way than the rest of us. After his brain was posthumously examined, Einstein was found to be in this category. "I want to make my brain highly connected, balanced, and working "in-sync" like these super humans. Is this possible?" A 2012 UCLA School of Medicine study found that the "corpus callosum," the grand central station-like cable of nerves cross-linking the brain hemispheres, was remarkably stronger, thicker, and more well connected in meditation practitioners. For those of us looking to maximize our potential, what does this monumental neuroplastic "healthy brain" discovery mean? By constructing a "hyper-connected," "ultra-efficient" bridge between our brain halves, meditation puts an abrupt end to our "Neuro-Cold-War," integrating our "east" and "west" brain hemispheres after a lifetime of separation. Harmonizing both brain hemispheres opens the door to a smorgasbord of benefits, with better focus, deeper thought, super creativity, excellent mental health, enhanced memory, and clearer thinking just the start. With 1 in 15 people suffering major depressive disorder (MDD) at any given time, there is no shortage of people ready and willing to put their brain under the microscope in hope of a cure. Thankfully, with journal after journal of promising insight into the so called "depressed brain," neuroscientists understand this ugly mental health issue's moving parts better than ever. A landmark Washington University School of Medicine study (Sheline et al, 1999) MRI imaged the brains of 48 women, half of which were suffering from major clinical depression. What did they find? Versus the control group, the "hippocampi" of the depressed patients had atrophied significantly, with a clear link between "number of years depressed" and degree of shrinkage. To illustrate the findings, when we break our leg, its size and strength slowly dwindle away inside our orthopedic cast. When depression has us on the ropes, our brain's hippocampus slowly wastes away inside our noggin. "So, if I want to lift myself out of depression (and prevent it in the future), I need to strengthen my hippocampus. Got it. But my gym doesn't have a hippocampus machine!" Save yourself a trip to the gym, meditation is your "ACE Certified" hippocampus personal trainer. A 2008 study published in the Neuroimage Journal found that, after only 8 weeks of meditation, the left and right "hippocampi" of participants had significantly grown in neural thickness, density, and overall size. This incredible finding means that adding meditation to your daily routine can, in essence — reverse depression's dirty wheels no matter how deeply your tires are "dug-in," while bulletproofing your brain to future attacks. With headlines like the Independent's "How The Beatles Meditation Technique Could Cure Depression," it appears that meditation's uncanny ability to lift us out of the doldrums is slowly entering mainstream consciousness. As John Lennon's famous lyrics so eloquently put it, "Imagine all the people... living for today." Indeed, a world full of (depression-free) meditators would certainly grant the legendary Beatle his wish. How Do Some Of Us Maintain Excellent Memory Through Old Age? We have all forgotten where we left our keys, blanked on a friend's name, or let a family member's birthday slip through the cracks. However, memory loss is not an inevitable part of the aging process. There are plenty of octogenarian brains out there firing on all cylinders, staying sharp as a razor well past the 80 year mark. Then, how can some of us memorize 100,000 digits of Pi like 72 year old Akira Haraguchi, while others of us can't even remember our coworkers' names? It's all about that big beautiful dome sitting atop your shoulders. Dr. Larry Squire, a world-renowned University of California (San Diego) psychiatrist, published a groundbreaking paper titled "Memory, Hippocampus, and Brain Systems" — illustrating just how critical the "hippocampus" is to learning and memory. For those of us looking to ace life's never-ending exams, climb the career ladder, or win 74 Jeopardy gameshows in a row like the "human fact machine" Ken Jennings, pinpointing this seahorse-shaped brain region has far-reaching implications. "So, if I want to have great memory and learning ability, then all I need to do is hop in a time-machine and be reborn to new big-brained parents? Sounds plausible." Think again. Much like the two aforementioned "legends of memory," Akira Haraguchi and Ken Jennings, you have the power to build within your cranium a powerful hippocampus. That's the power of neuroplasticity. "Then, how do I rewire my brain like these guys? I wanna' be a brainiac too!" As one of the most prominent neuroscientists in the world, Harvard University's Dr. Sara Lazar and colleagues have studied the meditating brain for decades. Among a long list of awe-inspiring healthy brain discoveries, her research shows that meditation dramatically increases "hippocampal cortical thickness," with magnitude determined by experience. In other words, like an artist molding clay, meditation shapes the learning and memory center of our brain into something beautiful. It was once believed that our intelligence was "set" the day we are born. Luckily, we know better now. Leak-proof your memory. Learn to superlearn. Discover meditation. What makes us truly happy? Many people believe that "achieving & receiving" makes for the happiest life. But the research says otherwise. According to the latest science, true happiness comes from practicing compassion. It is when we help our fellow man, when we feel connected to the world, when we give expecting nothing in return, when we are kind just to be kind, and when we see people as "other-selves" instead of "others" — that life takes on meaning and purpose. It seems that the old saying "Give... and you shall receive" is anchored in truth. "Sounds wonderful. I want to be a beacon of light too. But I also want to throw my shoe at humanity from time to time. Aren't kind and compassionate people born that way?" According to the science, no. Our brain (and our level of consciousness) can be strengthened like a muscle. That's the power of neuroplasticity. To illustrate, we have all heard stories of the elbow throwing, no holds barred Wall Street banker who gave up a life of riches to help others, whether teaching at a rough inner-city school (for little pay) or volunteering at an orphanage in India. The point is that we can "right the ship" at any point in life. We can level up our human "kindness o'meter" through our thoughts and actions, regardless of our past. We are never "set" in our capacities. While each day presents multiple opportunities to "spread the love," shifting into "kindness gear" is easier said than done. Luckily, meditation launches our "compassion consciousness" into orbit. And it all starts with the brain. A highly cited UCLA School of Medicine study found that the "right anterior dorsal insula" of meditators to be highly active while in session. What's the link? As shown by University of Wisconsin neuroscientists' brain imaging, this happens to be the same brain area that lights up like a Christmas tree when our "kindness & compassion o-meter" is full bore. Is it just a coincidence that many of history's greatest humanitarians were also meditators? Could it be that the ancient practice literally "forged" their brain toward kindness and compassion? Was it meditation's massive shift in consciousness that propelled them to do such great things? While becoming a kinder and more compassionate person may not put a Nobel Prize on your trophy shelf, it most certainly can make the day of anyone who crosses your path. It's often the little things that make the world a better place, the butterfly effect is a powerful thing. With your freshly upgraded "put yourself in other people's shoes" and "see your face in others" meditative mindset, how much positive change can you spark in the world? What's Better, IQ or EQ? What's the most accurate "successful career" forecasting metric? Is it how much of a "smarty-smartpants" we are? Once upon a time, just about every scientist would have answered yes, "IQ" determines how high we can can soar. Got a perfect SAT score? The CEO's corner office has your name on it. You can memorize 1,000 digits of Pi? There is a senate seat waiting for you. Solve a rubix cube in 6.54 seconds? You are on track to head NASA. Does this happen in the real world? No. Today, we know better. It's not the super-geniuses that ascend to the top of their respective fields. How high we soar and how far we go has a far more accurate crystal ball. In 1996, a world-renowned psychologist, Dr. Daniel Goleman, published a groundbreaking book that turned the psychological community on its head. In his New York Times international bestseller "Emotional Intelligence: Why It Matters More Than IQ," Dr. Goleman's case for "EQ over IQ" was so compelling that academic textbooks had to be rewritten in his name. So, what kind of characteristics do these folks display? People high on the EQ chart tend to be masters of both work and play. They usually have prosperous careers, long-lasting, fulfilling relationships, and tons of friends. They are often generous, empathic, self-motivated, with the ability to love and be loved. Since we aren't born with a fixed amount of this elusive characteristic, figuring out how to "fill up the old EQ tank" has been of particular interest to psychologists in recent years. After all, who doesn't want to be more popular and successful? In 2013, with the goal of mapping out the "EQ" regions of the brain, University of Illinois researchers CT-scanned 152 Vietnam veterans engaging in "emotionally intelligent" centered activities, like (in-person) social interaction. A landmark finding, the brain map imaging showed one particular region, the "temporoparietal junction (TPJ)," to be especially important. Dubbed the so called EQ "command and control center," figuring out how to strengthen this area of the brain would, in effect, power up emotional intelligence. "I would love to be popular and successful. But I think my EQ and therefore, my TPJ might be weak. Should I get a brain transplant?" Save yourself the headache. Meditation's got you covered. In 2016, a team of Spanish and German researchers (Yang et al) fMRI imaged the brains of 13 meditation newbies before and after 40 days of mindfulness training. What did they find? In addition to massively reducing their anxiety and depression scores (as illustrated by countless other studies), the meditators' had, in just six short weeks, significantly increased the "internal consistency" of their temporoparietal junction (TPJ). For those of us looking to climb the career ladder, master social grace, and just do better at life, what does this mean? By strengthening the brain's "EQ command & control center," meditation opens the door to a wonderful and especially important bundle of traits: self-awareness, adaptability, empathy, conscientiousness, self-motivation, emotional balance, the list goes on. Meditators have been the coolest of the cool for millennia, now confirmed by science. "That saber tooth looks like he wants free-range human for breakfast. Better grab my spear or get ‘outta here!" Considering what they dealt with on a daily basis, our primitive hunting and gathering ancient ancestors certainly needed homed-in survival instincts. To avoid becoming just another prehistoric lunch statistic, our neanderthal forefathers needed within their noggin a highly evolved "fear center" amygdala. They did, and it served them well. The problem is, our brains are still wired much like our stone-age ancestors. While we live in modern cities free of lions, tigers, and bears — our job stress, money problems, and relationship quarrels still trigger our "fight or flight" fear response eight days a week. With an estimated eleventeen-zillion studies pointing to stress as the #1 cause of disease, figuring out a way to downsize our primitive amygdala is critical to the future of mankind. It appears that we can take the "Caveman out of the Cave," but we can't take the "Cave out of the Caveman." Or can we? Stop the record. Science has discovered a way. It's called meditation. In 2011, Massachusetts General Hospital researchers fMRI brain scanned 51 adults before and after 8 weeks of mindful meditation training. What did they find? A staggering discovery, the greenhorn meditators had effectively silenced the "electrical activity" within their primitive amygdala(e), and in effect, had far fewer "anxiety, worry, and fear signals" bouncing around their beautiful brains. However, what shook the neuroscientific community to the core was that the participants had dramatically decreased (!) their amygdala(e) size/volume. And it didn't take years either, they accomplished this amazing feat in less than two months! The implications of this finding are tremendous. Knowing that it's possible to, like a light switch, turn off our primitive "caveman brain," we can bulletproof ourselves to the well-documented negative effects of stress — with anxiety, depression, and addiction the first moles to get whacked. But there's more. Other studies have found that meditation grows and "thickens" our prefrontal cortex. What's that, you say? From dark caves to sunlit skyscrapers, from incoherent grunting to the world wide web, from the muddy riverbanks to the far reaches of the solar system — we owe our prefrontal cortex a debt of gratitude. In essence, by shrinking our "Neanderthal" amygdala and growing our "Homo sapien sapien (yes twice)" prefrontal cortex, is meditation the secret to time-warping evolution? Can meditation shift humanity into a peaceful, space-faring, "Star-Trek-like" Type I civilization, as envisioned by Russian astrophysicist Dr. Nikolai Kardashev? One thing's for sure, planet earth could certainly use a little less "caveman" brain and a little more "astronaut" brain. As perhaps the greatest scientist to ever walk the earth, Albert Einstein undoubtedly had a very powerful and very unique brain. Founding modern physics ain't easy. It turns out that the great physicist's brain had actually been preserved for a short time after his 1955 death. While a number of photographs were taken, the full slideshow did not see the light of day for over 50 years. And when the pics did surface, every warm-blooded neuroscientist in the world was chomping at the bit. In 2012, with the full power of modern technology, a Dr. Dean Falk headed Florida State University team compared Einstein's brain images to those of 85 "normal" human brains. What did they find? With his "prefrontal cortex" (PFC) perhaps the most striking feature of all, the legendary scientist's brain dropped egg-head-shaped jaws the world over. Just how important is this brain region? As the brain's thought orchestrator, complex planner, deep thinker, and high level decision maker, if all the brain regions held an election, the prefrontal cortex would be anointed emperor. Specifically, it was the overall development, tightly packed gray matter, and vast surface coverage that made Einstein's prefrontal cortex so unique. It turns out that modern physics' "Theory of Relativity" is backed by a whole lotta' processing power. He was way ahead of his time for good reason. What if it was possible for us mere mortals to upgrade our brain in the same way? Imagine the possibilities if we each had even a fraction of Einstein's brilliance? Hit the brakes. Science has discovered a way. It's called meditation. A landmark 2005 study by Harvard neuroscientist Dr. Sara Lazar found that experienced meditators had much more neural density, thickness, folds, and electrical activity within their prefrontal cortex. Sound familiar? That's also what made Albert Einstein's brain so unique. Needless to say, the implications of this finding are immense. Upgrading the "king of all brain regions" opens a whole new dimension of powerful benefits: less anxiety, less depression, more success, more processing power, better decision making, better health, stronger willpower, higher IQ, the list goes on. To compound this amazing discovery, Dr. Lazar found that the more meditation experience a person had under his/her belt, the more highly developed their prefrontal cortex. Backed by a mile high stack of studies, the neuroscientific community now sees meditation as the "holy grail" for folks wanting to be smart, healthy, and successful. Another unique area of Einstein's brain was the "bridge" connecting his left and right hemispheres, the "corpus callosum (CC)." Thought to be responsible for his "otherworldly" creativity, when it comes to "how" his magical brain could have innovated physics to such an epic degree, his "thick and brawny" CC is one titanic reason why. Does meditation upgrade this brain area too? Yes! "Einsteinify" your brain. Rewire your life. Discover meditation. We have all been there before. Hours after getting into bed, bloodshot eyes still staring at the ceiling. With work looming only three hours away, here's to hoping the sandman finally grants our wish. Sleeplessness is not just a minor inconvenience. With our productivity, mood, energy, and health taking a roundhouse kick to the clavicle, chronic insomnia can really crimp our potential. "I got my eight hours last night, yet today I feel like a zombie. What gives?" It's not about being in bed for "X" hours. What matters most is "sleep depth." Quality over quantity, not everybody gets what they need. It is the deeper REM level of sleep where we detoxify blood, repair organs, heal wounds, renew cells, build muscle tissue, and so forth. We need about two hours at this stage every night. "Wait a minute, I only need two hours of sleep each night? That's easy!" That's two hours of "deep" REM sleep, buster. Since we spend about 20% of our night in REM, we actually need much more "sleep" to satisfy the requirement. Think 8 to 10 hours. And that's assuming our "doorway to slumberland" is not blocked by a "sleep is for the weak" t-shirt wearing bouncer. With about one in three adults experiencing insomnia at any given time, hitting that "measly" two hour REM "health & happiness" window is easier said than done. If you find yourself feeling tired, drowsy, or fatigued after what should have been a respectable night of shuteye (i.e. spending 8 hours in bed), then your sleep "depth" may be suffering. Luckily, scientists have studied the sleeping brain for decades, and have it (pretty well) figured out. Serving as our noggin's REM on/off switch, the funnily named, brainstem originating "Pons" regulates the main dreamtime chemical: melatonin. Weakness or abnormality within this 2.5 centimeter wide brain region throws sleep an unhittable curveball. For those of us at war with the sandman, drawing up a strategic battle plan is essential. After all, our mental, emotional, and physical well-being are hanging in the balance. As the brain's sleepy "four star general," fortifying our "pons" would essentially bring a lifetime of peaceful shuteye to all the land. Thankfully, meditation owns the sandman. In 2014, a team of Harvard and Stanford University researchers showed that meditation, powered by the magic of neuroplasticity, builds up a big and strong sleep centered "Pons." In other words, meditation literally molds the brain into a naturally deep sleeping machine. Regardless of how ravaged your road to slumberland may be, no matter how many potholes your insomnia may have dug over the years, meditation's "lullaby asphalt" will keep your ride silky smooth. If you want deep sleep every night of the week, then close your eyes to meditation.